Bill Mullins is a freak. And I mean that in the best possible way. I have personally been watching the lanky lead guitarist do his thing — which, for my money, he does better than almost anyone in Burlington — for roughly 15 years now, which is only about half of his Vermont career. Whether with the late, great Chrome Cowboys, surf-noir badasses Barbacoa, timeless art-punk band Blowtorch, Lowell Thompson & Crown Pilot, Persian Claws, or any number of other local projects to which he’s lent his incomparable chops, he’s always been a personal favorite. But here’s the thing: In all that time, dude hasn’t aged a day. Mullins looks and sounds exactly the same as he did when I was a teenager sneaking into bars to see him play — which is to say, like a lost Ramone brother, or Lou Reed’s second cousin. He is an ageless wonder, ever looming in the background in a black T-shirt and jeans, standing with almost comic stoicism while effortlessly tearing through riff after finger-shredding riff, only the occasional head nod suggesting he’s even awake. It is fitting then, that the unassuming Mullins would release one of the best records of 2010 with virtually no fanfare. Composed of a batch of songs he’s been working on “for a little while now,” his self-titled CD sounds as though it could have been made at any point in the last 30 or 40 years — kinda like Mullins himself. “Idle” introduces the guitarist’s affinity for the British Invasion-inspired rock and roll of American rock bands in the early to mid-’70s, with ringing electric guitars and a hooky but efficient melody. In particular, late songwriting great Alex Chilton seems to be a major touchstone, a notion verified by the following cut, “Rewind,” among several others. 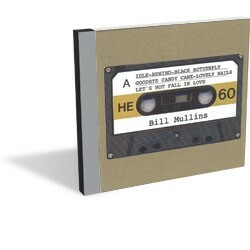 Mullins’ disc is the epitome of a solo project, as he wrote, performed and recorded the entire album by himself. The Elliott Smith-esque “Black Butterfly” is perhaps the most impressive example of Mullins’ multitasking, featuring a devastating guitar melody that intertwines with his youthful vocal lead and tasteful backing harmonies. But that last description could be applied to almost any of the disc’s 12 tracks. Whether on the jauntily moody “Goodbye Candy Cane,” marching pop gem “Lovely Nails” or a scorching rocker such as “Let’s Not Fall in Love,” Mullins is, well, freakishly consistent. That measured cool almost works to his disadvantage, as it’s all too easy to take each cut’s subtle brilliance for granted. Don’t. Whether from a lifetime love affair with rock, or simply spending the last three decades absorbing and amplifying the talents of the artists he’s backed up — or both — Mullins’ album is a clinic on American rock songwriting. Bill Mullins releases his self-titled album at Radio Bean this Friday.